When you find yourself in a Tokyo hotel, you can’t help exploring. It turns out that there’s a vending machine just down the hallway, which serves surprisingly cheap beer. Suntory is a name I associate more with whisky than beer, but I suppose the basic product (pre distillation at least) is very similar. 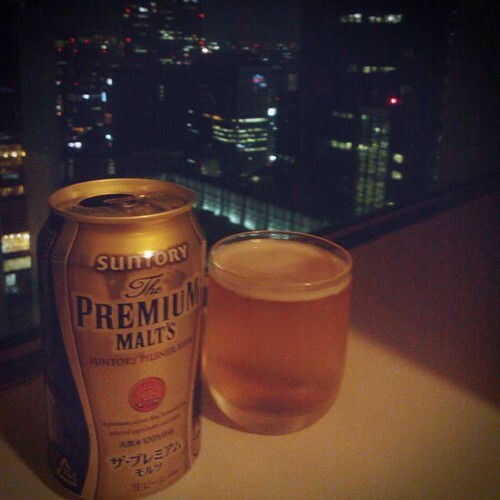 So, what sort of beer does 250 Yen (a little over two pounds) get you in a fancy hotel? Well, it certainly lives up to it’s “malt’s” name – lots of sweet malty aroma which carries on to the taste. Indeed, the sweet malt almost overwhelms the beer – it’s so sticky sweet as to taste almost unfermented. Other than that, it’s hard to discern much in the way of hop character – it’s a fairly blunt malt attack with some refreshing fizz to it. Halfway between a beer and a soft drink, but when it’s vending machine cold and with a view over Tokyo at night, it hits the spot nicely.